Who wouldn’t want to wake up and have the best day they’ve ever had…every day. The thought of waking up and starting your day so that you achieve your maximum potential and can reliably reproduce this effect is appealing isn’t it. That morning that jump starts your day, every day, is what The Miracle Morning by Hal Elrod, is supposed to do. He makes a big claim about the effectiveness of the Miracle Morning early in the book. This can mean making significant improvements with your health, happiness, relationships, finances, spirituality, or any other areas that are at the top of your list. The book starts by Elrod giving us some of his backstory which involves a car accident and learning that if we want success we need to stop worrying about the parts of our lives that we can’t control. If there is one thing that I’ve learned from my car accident, it’s that there is no point in dwelling on or feeling bad about the aspects of our lives that we can’t change. So, I didn’t. After he overcomes the mental and physical issues that resulted from his accident, things were looking up until the financial crash of 2008 where he lost pretty much everything. After loosing so much, Elrod, started to stumble into what became The Miracle Morning. He ends up figuring out that he’s just as good at anyone, that he needs to dedicated time to learning to be his amazing self, and that how he starts his day is key to making this happen. The core of The Miracle Morning process is his S.A.V.E.R.S. acronym. 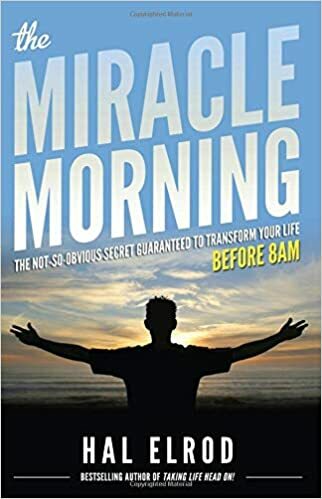 Elrod says that if we want to be in the 5% of people that really hit their goals, all we really need to do is follow his Miracle Morning process and the rest will fall into place. Before Elrod dives into his S.A.V.E.R.S., he spends a bunch of time getting you all energized to have a Miracle Morning. One point in particular stands out, in part because he created another acronym. Elrod says that your WUML (Wake Up Morning Level) is all decided the night before when you decide that however much sleep you’re going to get is the right amount of sleep to have an energized day. While Elrod puts all the power in our hands for how we feel in the morning, there is a bunch of scientific evidence that says he’s wrong. Yes, there are some studies that say if we feel we had a good night sleep, we are more alert. The problem is that this only goes for so long and then that 4 hours of sleep night after night means we start functioning little better than someone that is drunk1. Now that we’ve covered the lead up to what the Miracle Morning is, let’s dive into the individual components that make up the first hour of a successful day according to Elrod. Each of the next items should take 10 minutes of your morning if you’re going to follow the Miracle Morning process. Silence is all about starting your day without distractions. This can be meditation or prayer, or simple silence depending on where you lean. The main idea is that it should be calm and peaceful. To end this chunk on silence, Elrod, has a primer on what Miracle Morning meditation looks like. This is about positive self-talk so that you can improve the areas of your life that need improvement. If you’ve been bad at remembering names, it’s a statement about how names are important and that you’re good at remembering them. It’s rewriting your programming so that you can be a better you2. If you’ve never created positives affirmations, Elrod doesn’t leave you hanging as he provides a five step process to create the affirmations you’ll need. Next is visualization, which is subtly different than affirmations. Where affirmations are retraining your current brain, visualizations are dreaming about where future you will be. It’s about looking forward to the success you want to have. One interesting exercise that Elrod suggests is starting a vision board, which would have images of the success you want to achieve. Next up is 10 minutes of exercise. Even if you’re going to go for a run later, do 10 minutes of jumping jacks, or pushups, or burpees. This is all about getting yourself energized for the day so you can attack it with enthusiasm. Now it’s time to read. He says to aim for 10 minutes, but even if you do 10 pages a day you will get a number of good books done in a year. Elrod even gives you an “out” by saying that if 10 pages feels like too much, start with 5 and call that good. The big reason you read, is that there is no point in reinventing the wheel, learn from experts. The final item is Scribing, because he needed an “S” but this is journalling. Think morning pages or some form of reflection on yesterday then setting intention for today. Elrod also says it’s important to review your old writing so that you can recapture lessons that you may have forgotten about. Unfortunately he provides little direction on this front. While the traditional Miracle Morning takes 60 minutes, Elrod gives us a 6-minute version for those days that are crazy busy. This isn’t what you’re supposed to do most of the time, but he has it so that you don’t break the chain and keep going with something to start your day right. Elrod also acknowledges that some people work nights so “morning” is actually afternoon. He says that you just need to do this as soon as you get up, yes even before eating. Before Elrod finishes the book he talks about the importance of habits in the success of our lives. If a person is living a successful life, then that person simply has the habits in place that are creating and sustaining their levels of success. On the other hand, if someone is not experiencing the levels of success they want — no matter what area — they simply haven’t committed to putting the necessary habits in place which will create the results they want. Miracle Morning is an okay primer on habits, but James Clear provided much better material in Atomic Habits. Don’t expect Elrod to blow your mind with his habit talk in Miracle Morning. Should You Read Miracle Morning by Hal Elrod? If you’re looking for a decent morning routine, then Miracle Morning is a good book that’s way to long. The first 18% of the book is all hype and quotes from people you may have heard of that say Miracle Morning is great. The meat of the book, S.A.V.E.R.S., starts at 40% and is done by 70% of the book. The final stuff is all hype again. I’d give you chapters to go by, but the Kindle version I had didn’t have any chapters in it…so start with whichever chapter Silence is. The other issue I had with the book is that there is a Miracle Morning everything, like a Miracle Morning Superfoood Smoothie recipe. I was expecting to read about Miracle Morning super underpants that would help you be Miracle Morning comfortable while you sat in silence. If you’re going to read the book, don’t read the whole thing. Only read from about 40% to 70% and you’ll have 99.9% of the utility of The Miracle Morning by Hal Elrod.